I received the dreaded “Slow Down” message on the dash in my F430 the other day so thought I would document some notes about the system and the method I used to fixed my error. First of all it should be noted there are two Slow Down messages that can occur in the F430 – this is different to the 360 Slow Down monitoring system. The F430 can display the Slow Down warnings in two colours – red for exhaust gas temperature and amber for E-Diff problems. This post will cover the former message (exhaust temp) as this is what happened to me. 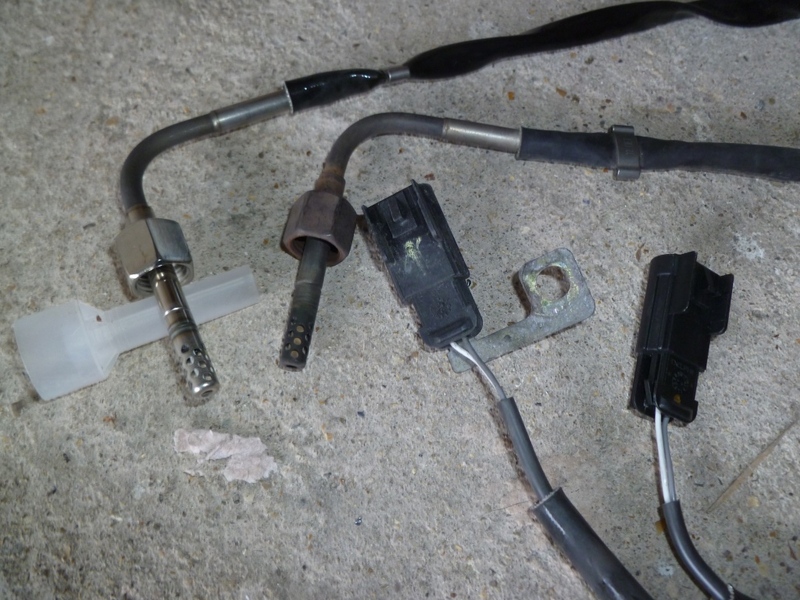 In essence, the motronics (ECUs) monitor the temperature of the exhaust gasses entering the catalytic converters. When the temperature is detected above the certain threshold the Slow Down message is displayed on the dash. If the temperature continues to climb, the message flashes and the motronic will shut the fuel off to the side of the engine affected in order to prevent expensive damage. 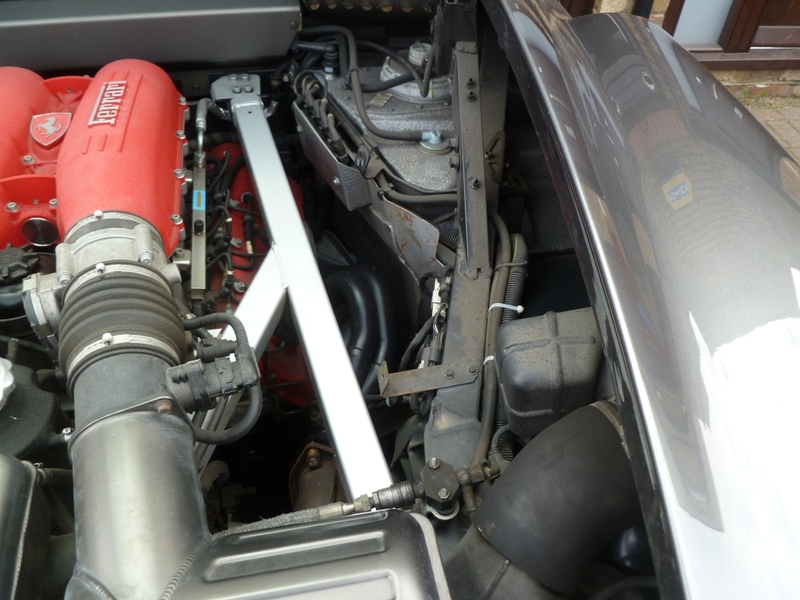 Note that the F430 system is slightly different to the 360 whereby the motronic takes the input from the thermocouple directly as opposed the signal being processed by a separate ECU on the 360. This makes things a little more robust. The Slow Down message appeared on my car when the engine was cold. This meant that the exhaust gas temperature couldn’t be too hot so the fault must have occurred with the detection. If the engine was hot when the message appears then it is important to determine how hot the catalytic converters are. I recommend buying an IR heat gun with a decent temperature measurement range. Measure the temperature of both sides – if one is significantly hotter than the other then that is where your problem lies. It is also possible to see the catalytic converter glowing red in low light conditions. If one side of the exhaust is overheating then the focus should be on finding the cause – usually unburnt fuel entering the exhaust (check the coils and spark plugs). If one cylinder isn’t firing, your IR heat gun will soon detect which one it is by seeing which exhaust outlet is running cold. The last error was from when I cut the power last and is of no concern. 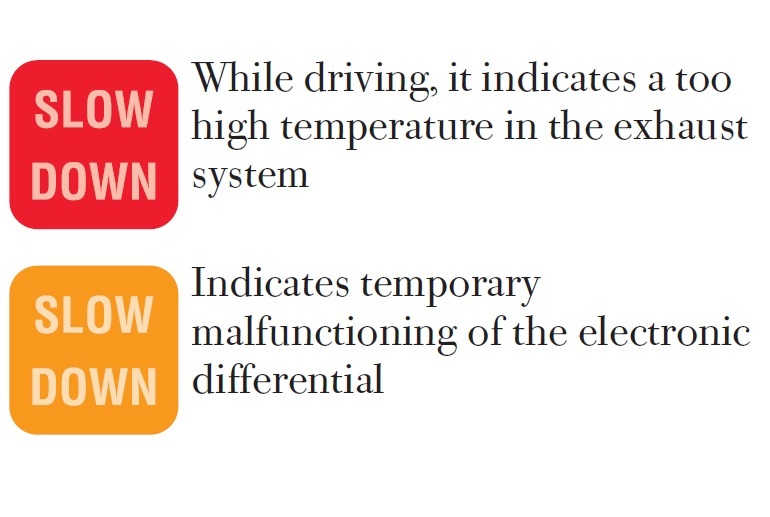 The first error is logged when the temperature is sensed above the first threshold, the second when the motronic has to intervene and cut the fuel to the engine. As this was happening when the engine was stone cold the problem looked like a faulty thermocouple. 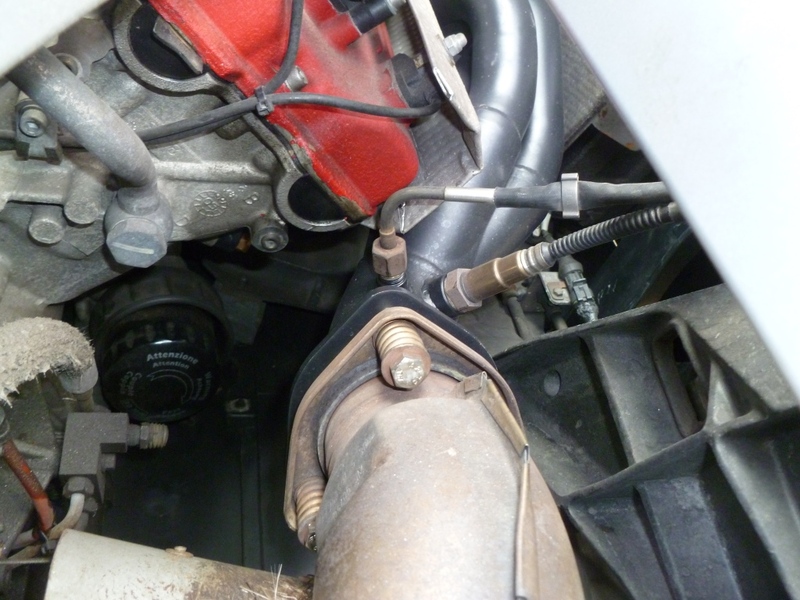 I buy all my parts from Steve Holdsworth at Joe Macari – Steve had one on the shelf and I had it in my hand within a day. 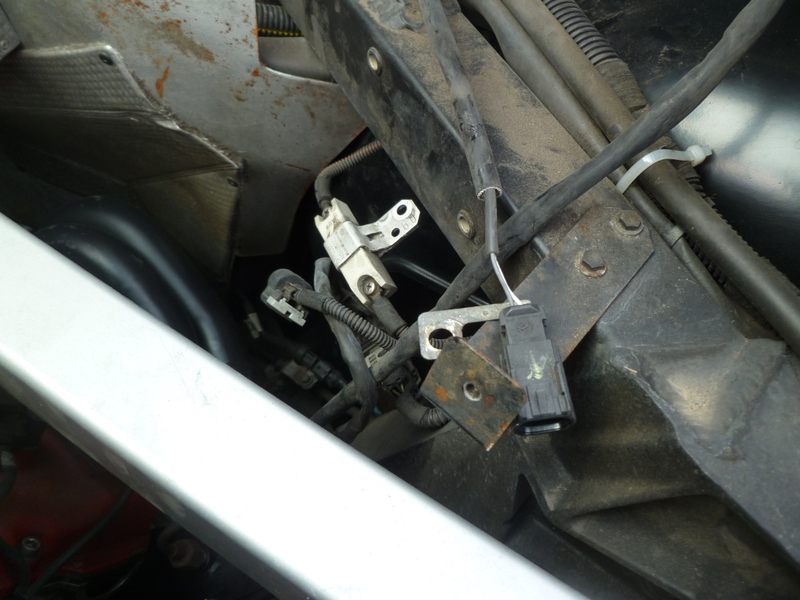 Fitting was very easy – firstly cut the power to the battery to clear the ECUs. Next remove the engine cover panels. 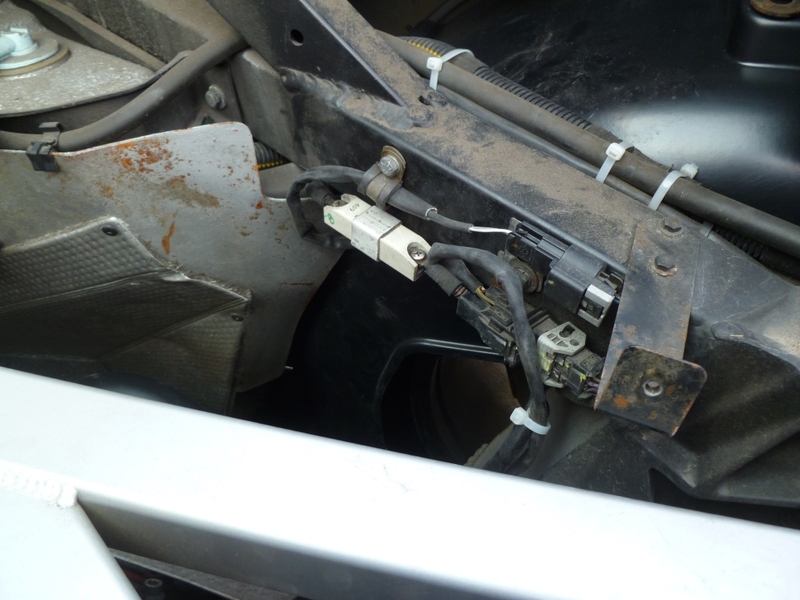 The thermocouple is mounted on the exit to the manifold, the left hand sensor in this picture with the 90 degree wiring shield. Undo with a 17mm spanner. In order to get the other end of the cable off all three connectors shown in the picture below have to be unbolted from the chassis (use a 10mm socket). 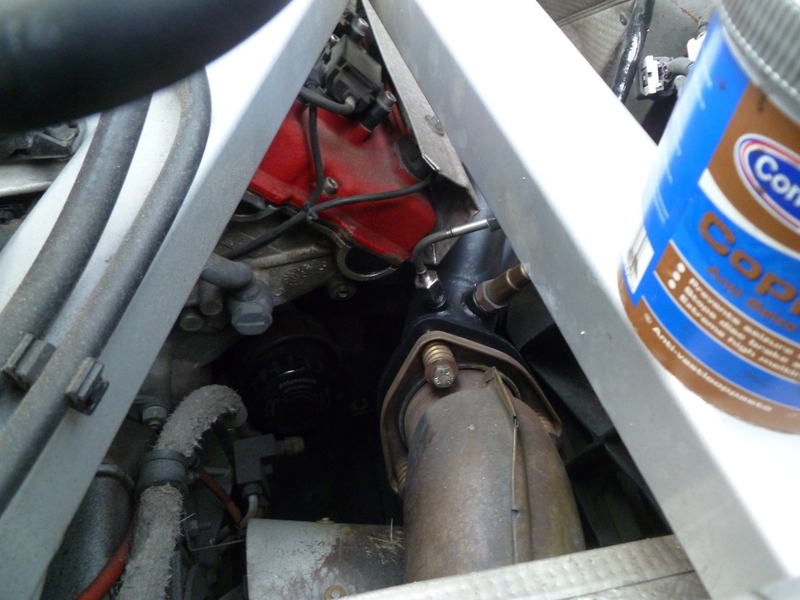 Refit the new thermocouple, using a little anti seize compound on the threads of the manifold. Reconnect the other end to the loom and bolt up the connectors. Zip tie all the cables back together again. Put the cover back on and re-connect the battery. This cured my error and now the car is running very sweetly. As always, thank you so much for the helpful post. Do you have the thermocouple OEM part number? I trust that you are well. I am getting slow down light shortly after start up on the 360 so I am confident that I don’t have 900 degree cats! I also revived a one off p1446 error code that hasn’t recurred. Is it possible to distinguish between needing to replace the actual thermocouple or needing to replace the exhaust TCU? Do you believe that both parts could be causing the SDL? Many thanks as always. Sam. 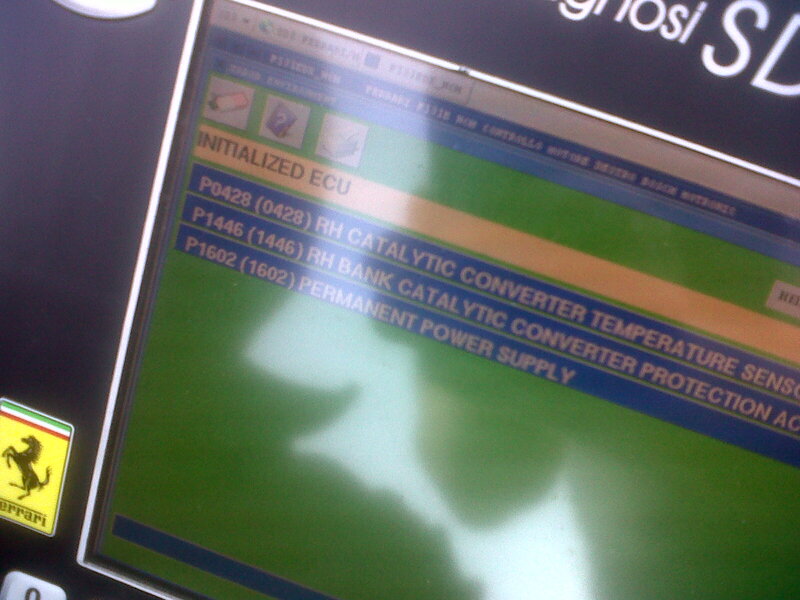 It will be either the cat ecu or the thermocouple. You can test them but you need a quality oscilloscope.